People who have suffered a stroke also face heightened potential for further heart-related problems. A new health breakthrough has found that stroke survivors who smoke cigarettes up the ante considerably for suffering another stroke, a heart attack, or even death, according to a recent study published in the journal Stroke. The study comes from Melbourne, Australia, and includes 1,589 patients who had a first or recurrent stroke between 1996 and 1999. The researchers followed them for a decade, tracking demographics, deaths, recurrent strokes, and heart attacks. They found that those who quit smoking before their stroke had less risk of poorer outcomes than those who still smoked. These new findings represent fresh incentive to kick the smoking habit, or not to start in the first place. 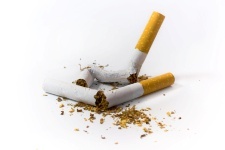 It clearly shows that smokers fare far worse after strokes than people who don’t smoke. The researchers found some other key information, including the fact that people in more disadvantaged areas are more likely to smoke. About 52% of current smokers belonging to the most disadvantaged group, compared to 31% who had never smoked. The study also showed that smoking actually had the worst impact on younger patients. The study focused on the most common type of stroke: an ischemic stroke, which is caused by a blood clot. The researchers didn’t link smoking to poorer long-term outcomes for patients who had an intracerebral hemorrhage (a stroke caused by bleeding in the brain). These are the clearest results yet to shine a light on smoking’s impact on long-term health after someone suffers a stroke. Strokes are already the fourth-leading cause of death in the U.S. Smoking just adds more pressure to the situation. One last sobering fact: One U.S. adult suffers a stroke every 40 seconds. Kim, J., et al., “Baseline Smoking Status and the Long-Term Risk of Death or Nonfatal Vascular Event in People with Stroke: A 10-Year Survival Analysis,” Stroke 2012; published online October 25, 2012.